As I sat down for brunch with friends in The Hamptons, I noticed a four-inch long, black stick floating in a glass pitcher of water on our table. It was hard to miss and I wondered why no one else seemed to be concerned. "What the hell is that?" I asked, pointing. Panicked, everyone stopped talking and looked around. When their gazes followed my pointing finger to the pitcher they visibly relaxed and in unison said "charcoal" and went back to their convos. Ok. Sure. Why not? Turns out, charcoal is HOT. It's having a moment. So, before you head outside to your grill there's a few things you need to know about how this works. Common charcoal, or carbon becomes activated when it goes through a heating process (chemical or steam are two common methods). This process allows the charcoal to develop little spaces inside, often referred to as pores. Simply put, it's the pores. Those pores that are created during the activation process create TONS of space to trap chemicals and impurities. These pores can absorb tens of thousands times its own weight in toxins. In fact, activated charcoal has long been known for its medicinal uses like treat poisonings and lower cholesterol. Oh, and it's also developed a reputation as a hangover cure. Drink your charcoal: Australian-based company COMME.CO sells all-natual, medical grade, activated charcoal products made from coconut husks. What should I use activated charcoal for (other than an accidental poisoning?) And where can I get it. 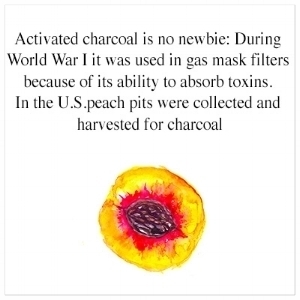 It's not surprising that activated charcoal has found its way into a wide variety of health and beauty products due its ability to gobble up impurities. These products are dedicated to keeping their products clean and cruelty-free. If you're looking to dip your toe into the charcoal waters, head down to your nearest drugstore (I found this line at Target) and pick up a bar of Yes To Tomatoes Activated Charcoal soap. At $5 it's a guilt free experiment. (The line also includes a charcoal cleanser and face mask). Natural skin care company, Franklin and Whitman offers an AC and Matcha Green tea product that promises to purify and reduce inflammation. Spruce Hill Face Mask ($25). Boston-based company Shamanuti produces a charcoal product that has developed a local cult following. It's Activated Charcoal Cleanser is lauded for its effectiveness as a treatment for inflammation (especially acne, rosacea and eczema). Bonus: it doubles as an excellent shaving cream.